Home > Blog > Dial Down The Holidays And Year-End Stress! Yes, it’s that “most wonderful time of the year”! Well, maybe. 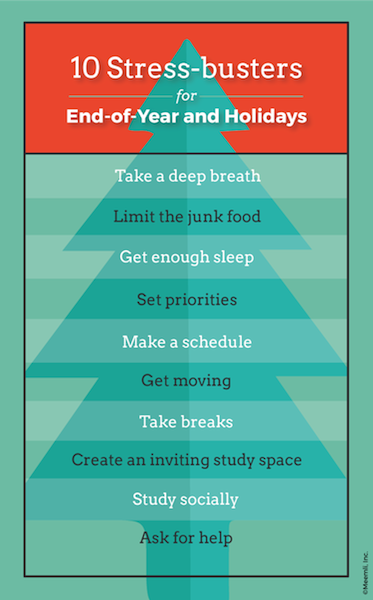 There is the unavoidable holidays and the year-end stress as everything happens in a few short weeks, even if some of it is fun. For most students, the season becomes enjoyable only when school commitments are done and the winter break has begun. Relax. It is possible to manage finishing assignments, writing reports and handling finals and still find it possible to enjoy the season with friends and family. It just takes a little planning and self-care – we’ll show you how! Too many things to do? Just breathe. Start by inhaling slowly and exhaling deeply. It’s a scientific fact that deep breathing helps you relax. Best of all, you can do it anytime, anywhere, without any props! Hey, it’s the holidays. There will be tons of sugary, fatty goodies wherever you go. Go ahead and enjoy – some of it. Don’t overdo it and remember to balance it with good healthy food when you can. Your body will thank you with less stress! If you feel tired, you’re really not going to do so well taking exams, turning in papers, or even playing video games with your friends. According to this article, lack of sleep drops you into an unhealthy spiral. When you create your schedule, put in time for sleep! As noted earlier, this time of year is full of things to do – what you must do, and what you want to do. Take time to figure out what is most important to you and your family (school work is pretty important too!) and feel free to decline invitations or postpone unnecessary work. As with almost anything, a schedule is a must to help you stay on track and also make you feel you’re on top of things and consequently lowering the holiday and year-end stress. Whatever is your favorite planner, use it to list everything – school work, extra curricular, family and friend gatherings, personal time – it’ll help keep you on top of things. You’ve heard this before. Exercise reduces stress, helps you sleep and helps work off the calories from those holiday goodies! It can be fun too, especially if you go play a sport with a team or go for a run with friends. Self-care is critical. Having some downtime to listen to music, watch a favorite show, hang out with friends or bake cookies, will help keep your mind feeling refreshed and your whole self a little more relaxed. 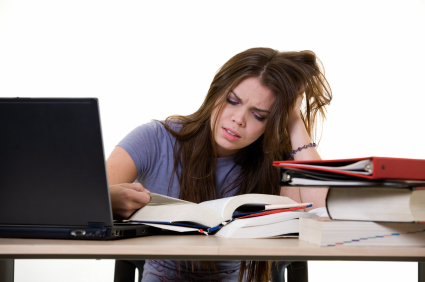 Yes, you have to do your school work though the holidays are here. Go ahead and have some fun decorating your space, however you like it. Your space will make studying feel a little merrier! If you can, take a break from solo studying and do it with your classmates. Prepping for a history test can be less stressful with friends (unless group-study doesn’t work for you). You can gather together for some holiday goodies and then bust out the books, or if you can’t meet in person, gather online for a little study-and-chat time. It it gets to be too much for you, and you’re feeling overwhelmed, ask for help. Your family, friends and teachers can help you with the academic challenges. And ask for help if your stress is getting to be more than you can handle – your family and teachers can give you the guidance you need. Notice something about these tips? They could be useful for anyone who’s juggling a lot of to-dos and is being crushed under the holidays and year-end stress, so feel free to share. The Meemli team wishes you happy, stress-free holiday season!